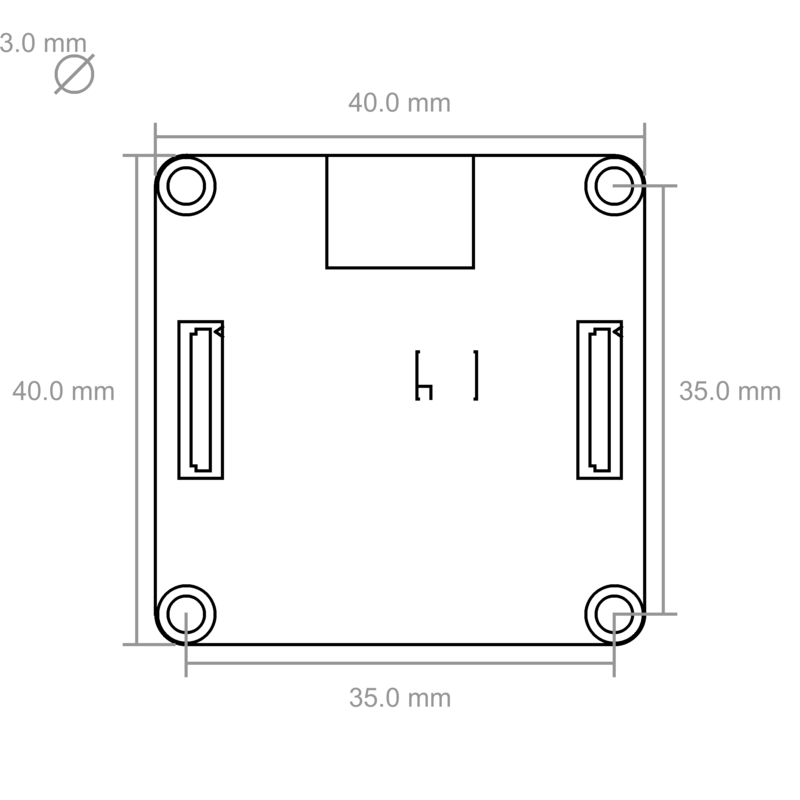 To establish a RS485 bus with Bricks, two RS485 Extensions and two Master Bricks are needed. Both Master Bricks can be connected to a full stack of Bricks and Bricklets, whereas one Master Brick is battery powered and one is connected with USB, Ethernet or WIFI to a PC. 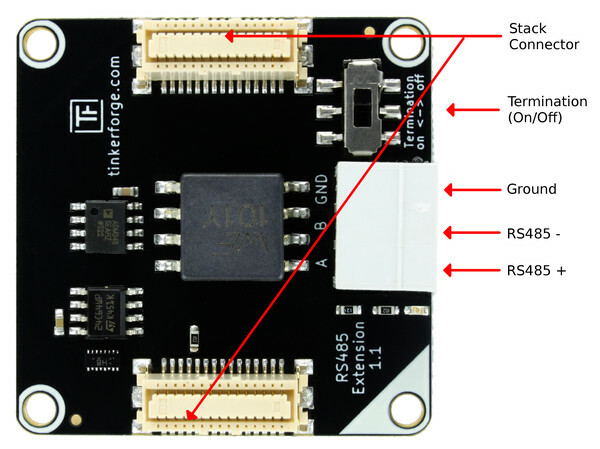 From a programming perspective the RS485 bus is completely transparent, i.e. the two stacks can be used exactly the same way as if they were both connected via USB. 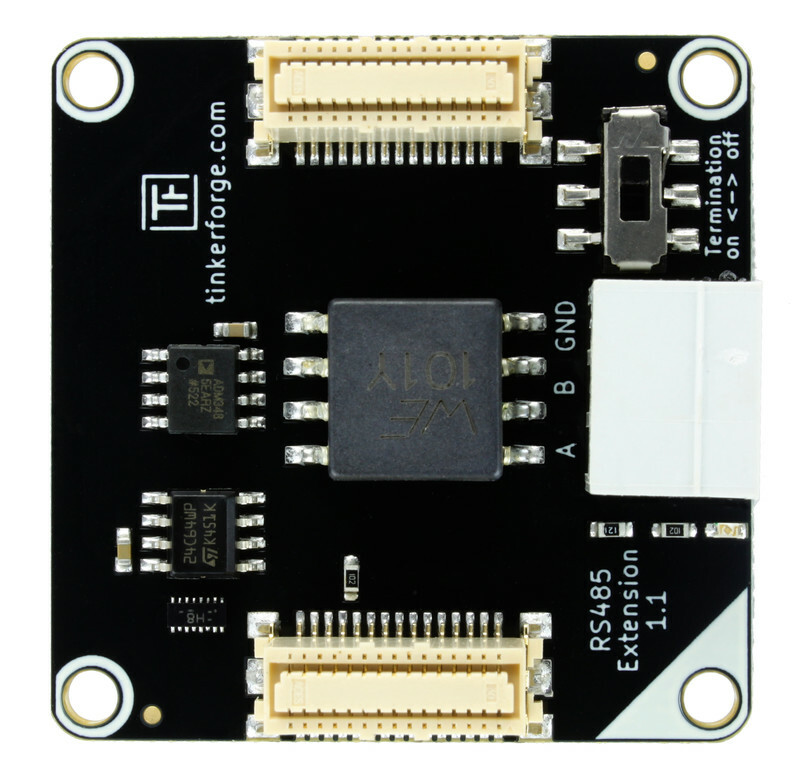 It is also possible to create a bus with several RS485 Extension where only one is connected via USB, Ethernet or WIFI to a PC (many-to-one routing). The following picture shows the connection possibilities of the RS485-Extension. A RS485 bus consists of one master and multiple slaves. RS485 master is the Master Brick which has a USB, Ethernet or WIFI connection to the PC running brickd. 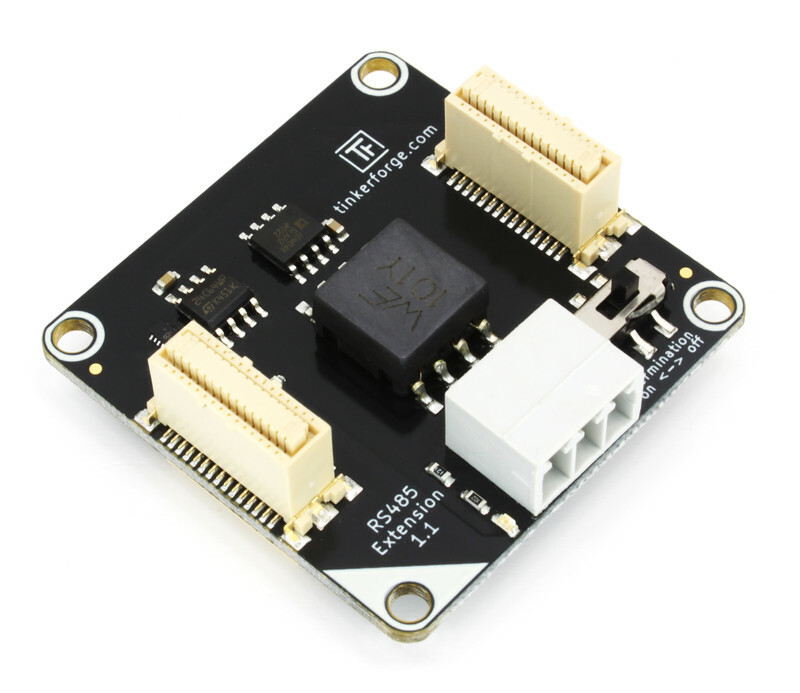 All the other Master Bricks with RS485 Extension must not have a USB, Ethernet or WIFI connection (they can use a USB Power Supply). Each RS485 slave is identified with its own ID. The IDs have to be unique on the bus. To create a RS485 bus, stack the RS485 Extension on top of a Master Brick. Connect the Master Brick via USB, Ethernet or WIFI with your PC and start the Brick Viewer software. 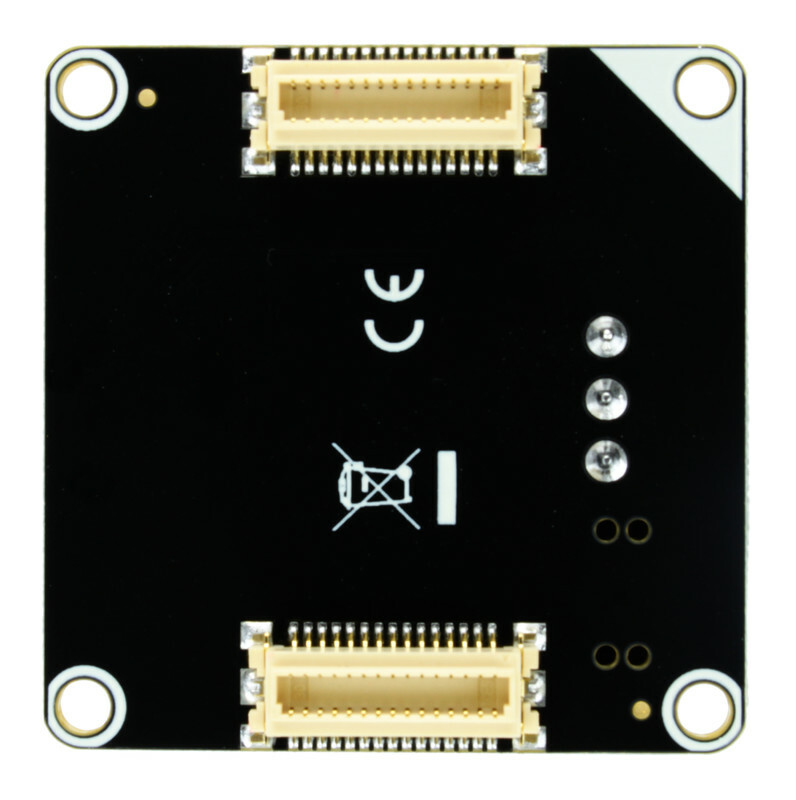 You should see the Master Brick view with the identified RS485 Extension (see images below). Configure the extension as slave or master (as described here). If you have configured all extensions you can build your system. Connect Bricks and Bricklets as you like. The Master Brick of each stack has to be the lowermost Brick (except if you are using a Power Supply). The RS485 Extension can be positioned in the stack as you wish. Wire up the RS485 stacks and set the termination switch on the first and last RS485 Extension in the bus to "on", as shown below. If the bus is only a few meters long then the cable you use should not matter. If the bus is longer than a few meters then some kind of twisted pair cable is recommended. Common telephone cable is often twisted. Even better is Ethernet cable, because it is twisted and often shielded. If you use a twisted pair cable, make sure to use the same twisted pair for A and B, but use another twisted pair for GND. You have to power up the slaves before the master, since the RS485 master searches for slaves only at startup. You should now be able to see all connected stacks in the Brick Viewer. To configure a RS485 Extension you first have to choose the baud rate, parity and stop bits. If your bus isn't absolutely huge you should probably choose "speed: 2000000 (2Mbit/s), parity: None, Stop bits: 1". If you start to get timeouts and the CRC error counter is rising rapidly, you might want to lower the baud rate. If you want to use a stack with RS485 Extension in your existing Modbus network, you have to match the values with the other bus participants. For slave configuration choose "Slave" as type and set an address for the slave (1-255). 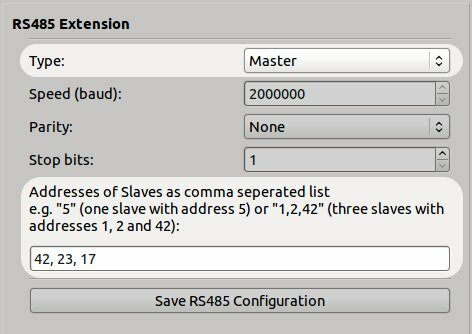 For master configuration choose "Master" as type and input the addresses of the slaves in the RS485 bus as a comma separated list. At the end, press "Save RS485 Configuration" to save the configuration permanently on the RS485 Extension. The Master Brick has to be restarted to apply the new configuration. If you want to change something in your bus, e.g. add new Bricks or Bricklets, you have to power down the stack you would like to change, change it and repower it. If you restart the RS485 Master, every Brick/Bricklet of the RS485 network will send the initial enumeration message again. If you restart the RS485 Slave, only the Bricks/Bricklets that are connected to this stack will send the initial enumeration message again.